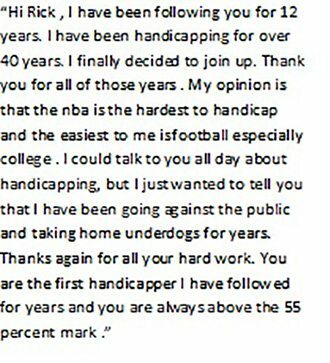 I Received and email this morning that I would like to share that I believe is instructive on analyisng certain betting situations that come up from time to time. I’ve been experimenting with college totals. I don’t have any models. Does public betting have any significance? My thinking is in high profile games like Duke vs NC yes, but in games like Columbia vs Princeton no, and in games like Michigan vs Iowa perhaps. Is it +EV to fade big moves? For example tonight Brown vs Dartmouth total opened at 142 and closed at 148. Does it make sense to blindly bet the under regardless of models, variables, etc. Public for whatever it’s worth was 52% under. There seem to be a few games like this most days of the week. Yes, Public %, in my opinion, is significant in almost every situation. The questions is it significant enough to make a wager. In college hoops, there are certain situations that historically have been profitable wagering on the under. Neutral court games are one of them. But overall the totals in college hoops are even more difficult than the sides. One thing that is very significant in college hoops is the Volume of wagering on the game. So if you have a game where only 200 wagers have been made its hard to draw any conclusions compared to a big ten game where 20,000 wagers have been made. So the greater the volume the more the public % becomes relevant. The big moves are tricky. First, you need a baseline to work with. Pomeroy is a good solid one. For a few years some totals would come out 5 to 10 pts below what Pomeroy had them on Pinnacle. I made a lot of money betting middles on these. But anymore Pomeroy and the line is pretty close. But I would double check the Pomeroy number first. Now, this does not consider what the line is nor what the public % is. But you see there is less of a hit taking the under right from the start. If you faded moves of 7.5 or more here is what your results would have been:421-421 -10 -3.2%ROI Anything less would be worse. If we look at games where the under has public betting of <38% with a 5pt move we get 347-322-8 51.9%. -.2% ROI. But moving things around a little if we only consider lines of =>158.5 and a public % of under 38% putting the move at =>5 pts move we may have something. 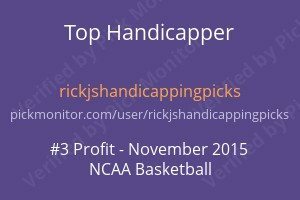 49-21-0 70% and a 34.1% ROI. So you get 7 plays a year out of this. Then consider that we have put in numbers to get this result and also consider the sample size of 70 games. You would have to wait another 10 years to see how this plays out in order to have any hint at it being reliable. So in short No., Unless you feel like gambling on a method that has only been backtested with no real time testing. on a sample of 70 games. That is asking for trouble. Its hard enough to come out on top with methods that pass both backtesting and real-time testing. This gives you an idea of some of the analysis that goes into coming up with positive EV situations.